The highest selling issues of fashion/gossip magazines are usually those which features close-up pictures taken at awards shows. Don't you just love to look at the pretty gowns and fabulous bling and daydream that it was YOU walking down the red carpet? Well, the Peranakan Museum is giving you a chance to do just that. Bring a girl friend with and enjoy 1-for-1 admission this November. 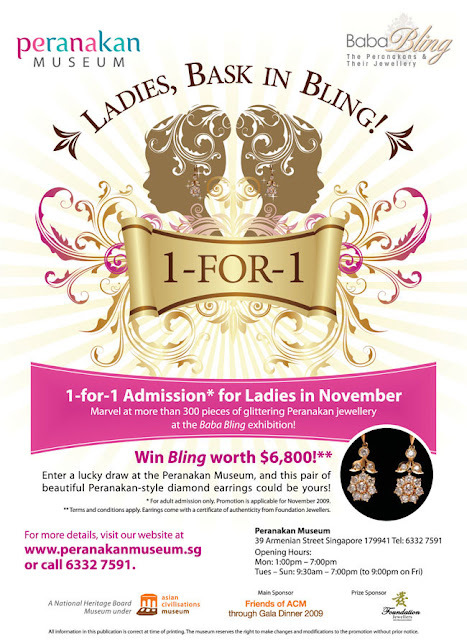 You also get a chance to win your very own bling worth $6,800!